Freeport, Maine is a charming town that’s just under an hour from the Dockside Guest Quarters in York. Freeport has beautiful natural features including Wolfe’s Neck State Park and the Desert of Maine. However what the area is perhaps most well known for is shopping in Freeport. The variety of stores makes shopping in Freeport a perfect day trip from our Coastal Maine inn. There are both locally owned shops with unique goods and big name brands that you’ll instantly recognize, so no matter what you’re looking for, there’s a good chance you can find it in Freeport. 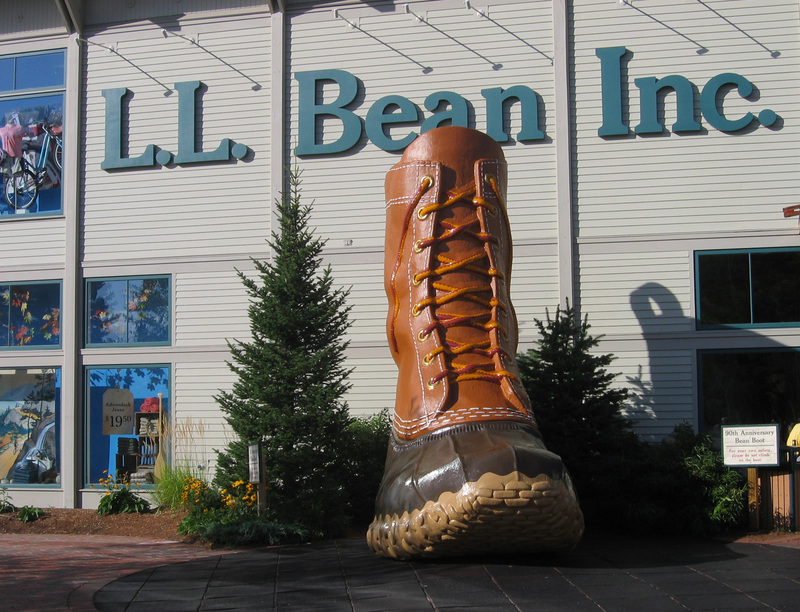 Most notably, the flagship store for the iconic Maine brand L.L. Bean is located in Freeport. So, take a look at a few of our favorite places for shopping in Freeport and start planning your day trip from York! From outdoor gear and clothing to charming handmade crafts, shopping in Freeport, Maine is definitely worth the day trip from York. With both big brand stores that you’ll recognize and stores with locally made art and decor, you can find the perfect thing to commemorate your time in Maine in Freeport. When shopping in Freeport, many people’s first stop is L.L. Bean. This iconic Maine brand has been making the highest quality footwear, clothing, home goods, and outdoor gear since 1912. It is famous beyond Maine due to its success with catalogues and now online ordering, but there’s nothing quite like experiencing it in person. The Freeport store is the flagship store and the Freeport L.L. Bean campus includes several more stores specializing in certain categories of goods. The other stores include L.L. Bean Hunting & Fishing, L.L. Bean Bike, Boat, & Ski, L.L. Bean Home, and the L.L. Bean Outlet. From their signature weatherproof Bean Boots to kayaks and other gear, you can find it all at the L.L. Bean Freeport Campus. Another well-known outdoor outfitter, The North Face has an outlet store in Freeport. Fleece jackets, winter outerwear, footwear, and outdoor equipment are all available at The North Face. A locally owned quilt shop, Cotton Weeds has quilting supplies and a large variety of fabrics. They also offer workshops and classes for those looking to improve their skills. The Salty Lobster has fantastic Maine art, crafts and clothing. If you’re looking for something unique and locally made to take home from your trip, then this is the place to go. There is even a live lobster in the store! Wilsons leather offers fine leather goods such as clothing, handbags, and footwear. They also have plenty of accessories to choose from. When planning your day trip to enjoy shopping in Freeport, be sure to make your accommodation arrangements in York at the Dockside Guest Quarters. Our guest accommodations encapsulate New England charm in their decor and modern comfort with their amenities. Our York Harbor bed and breakfast is the ideal place to call your home-away-from-home during your time in the area. Plus, our onsite Restaurant is one of the best in the area. The Dockside Restaurant offers fine dining cuisine without the pretense of some other establishments. So for great accommodations, amazing food, and breathtaking ocean views, there is no place better to stay then Dockside Guest Quarters. We’ll see you soon!